As part of our Anti-SuperBowl party, I knew I wanted to serve something sweet, small, and cute. I figured miniature cupcakes would be just the thing and, this being the south, settled on Red Velvet Cupcakes. My mother once described red velvet cake as "chocolate cake with a bottle of red food coloring!". These cupcakes put the lie to that description with a flavor all their own and only a few tablespoons of red food coloring. They are complex and nuanced and absolutely delicious. This post has been linked up to Sweets for a Saturday over at Sweet as Sugar Cookies. 1. I let my cupcakes cool overnight and frosted the next morning using a rubber spatula, a swirling motion, and a lot of patience. I then sprinkled with a 50/50 cinnamon/sugar blend. 2. These are sophisticated and delicious, the cinnamon cream cheese is the perfect finishing touch. 3. For only containing 3.5 tbsps of food coloring, these were vividly red. Not day-glo bright, but a nice deep, rich red. 4. For regularly sized cupcakes, bake at 325F for 20-25 minutes. 5. 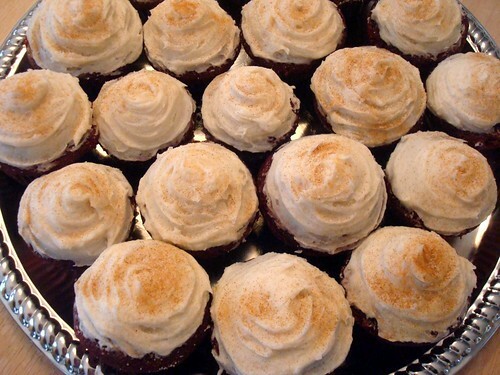 Since the frosting has cream cheese in it, these are not something you want to leave out for hours and hours. Chill until serving. I've never had red velcet cake. But I'm deeply impressed how you managed to put the frosting on top of them. It looks like you never did something else all your life! My son loves red velvet cake. Red is his favorite color, so naturally this cake is too. I am always amazed at HOW much food coloring it requires!!! !